I am the caller in this podcast and it bewilders me how so many ignore that Kaku completely evaded the issue that I was presenting. In their over fifty years of alleged use, no spacesuit or its never-seen ice sublimator cooling system has ever been publicly demonstrated in a radiatively-heated walk-in high vacuum chamber duplicating the pressure and temperature conditions of orbit or the moon. Absurdly, no spacesuit ice sublimator has ever been mentioned in any academic-level heat transfer or thermodynamics book despite representing one of the most marvelous heat transfer devices ever conceived or concocted. Our space program shouldn’t be a faith based thing. Dare to demand a public spacesuit demo. We can PROVE or disprove the hoax. 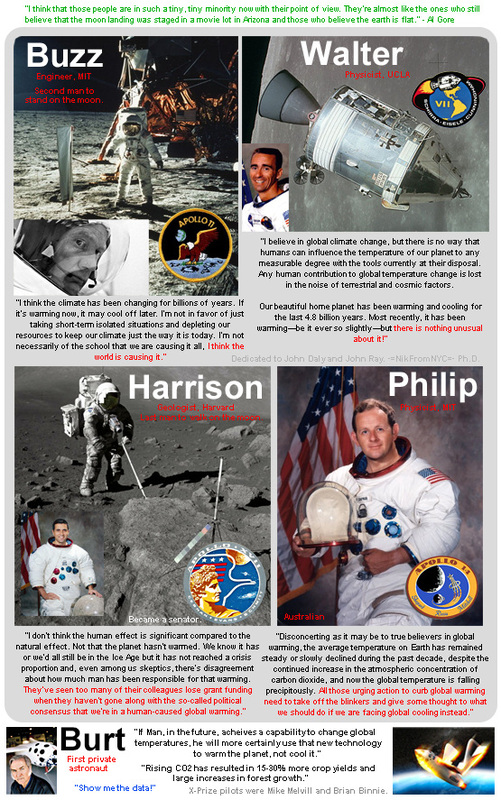 @ Neil Baker…NASA doesn’t have to release anything that’s classified, which space suits are probably one of them. Also, I’m embarrassed to say I’m from the same city as you. you are doing the same thing as Kaku in the clip. he takes the discussion to something totally different from what the caller raised, and just creates a strawman argument. he comes across as a total fake. why would you be pissed at somebody from your city that has put forward his opinion and asked for clarification? it is bizarre. why would spacesuit technology from 50yrs ago be “classified”? that’s absurd. Alas, crackpots have infested this thread, but I want people to strongly note that those who Al Gore’s massive team of climate alarmist call Moon landing deniers or flat earthers include those who actually went to the damn Moon! So, if I discover evidence which contradicts the official story that yourr uncritical mind accepts unquestiningly, I must therefore be a conspiracist, Dan? No matter how blatant might be the deception in the original BigStory? Doesn’t leave me much enthusiasm to debate with you, lad. I’ll leave you to your delusions, thanks for the wind-up. The video makes me wonder if the great Michio Kaku has seriously considered the orful possibility that the Lunatic Landing coukd possibly have been a hoax. The movie we watched in 1969 MUST have been the “back-up” video, shot on terrestrial location in Nevada and elsewhere by NASA. The back-up movie woud have been intended to be screened in the dreadful case where the mission failed FOR ANY REASON WHATSOEVER…. to be screened in honor of NASA’s 1961 promise to JFK. If what we saw was the REAAL THING … then where IS the back-up video? It must exist: don’t try and tell us NASA failed to shoot a “just in case” studio version…. Sorry for thread necro, but, yeah- glad I am not the only one who identified this right away as a faulty analogy and a snide smear to millions of people around the world. 1) Kaku has nothing to do with any space program including Apollo. He is not an authority on the subject. Here on a live radio show, he does a poor job of responding proving… what? He’s a lousy radio host. 2) The caller asks his “questions” in a very strange way, opening with an admission that his mental health is an issue. And then essentially making statements that it’s all fake because of reasons. Those reasons are easy to prove wrong. “you can’t find any information on them”. There is tons. 250+ documents on NASA’s website alone. Etc etc. 3) The spacesuit cooling system works by letting water freeze then sublimate in a vacuum. A very normal natural physical phenomenon. You may not be familiar with it, but freeze dried food is made this way. It works, 100s of videos on youtube of people freezing water in a vacuum chamber. The caller and Kaku did a lousy job here. There is nothing positive for either side of the argument.